Enjoy Ingolstadt Village with DriveNow! 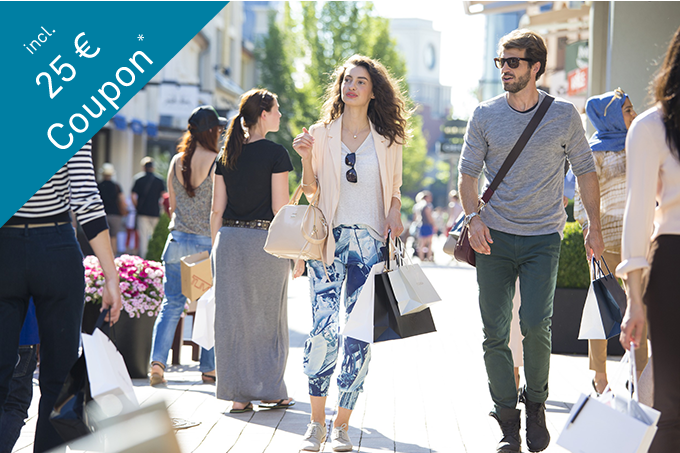 Now you can enjoy the temptingly low outlet prices of Ingolstadt Village cheaply with DriveNow, getting you there and back again, together with your shopping! And as an extra little cherry on the cake, shopping vouchers for you and your passengers make sure that you enjoy your shopping spree to the full! A €25 shopping voucher for you and up to three friends. * No minimum purchase necassary, valid for all brands. If you rent a DriveNow car for immediate use, you can book the Experience Package directly in the car. Simply jump in, log yourself in and go to "Experience Packages" in the booking summary. You can now select the package you'd like, enter the number of passengers and book the package. That's all there is to it! We'll send you a confirmation via SMS and email with your booking number, which you'll need to show at the cash desk of the Information Office.